Charvis, however, didn’t let the slip on the road stop him. Indeed, he had been boxing since he was a young man. “My dad introduced me to combat sports,” he says.“He was a fifth degree black belt and Tai Kwan Do.” It was clear early that Charvis had a talent. “When I turned nine he stopped teaching karate,” he says of his father. 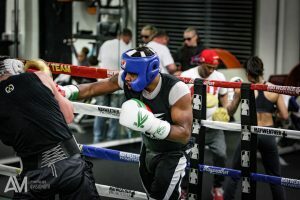 “Then I found a boxing gym in my hometown of Fremont, Ohio.” Charvis had found the sport which would define him. Perhaps that move out west will pay off in more ways than one.